These are great. They’re similar to flapjacks, but because they’ve got fruit in, you can call them “breakfast bars” and say they’re healthy. It’s really easy. Pre-heat the oven to 160C/320F/gas 3. Pop the butter, sugar and syrup into a pan and heat until they’re melted. Meanwhile put all the other ingredients into a large bowl. Once the sugar, syrup and butter have melted, pour it over the rest of the ingredients and mix it until everything’s coated. Spoon the combined mixture into a square tin (about 23cm x 23cm or thereabouts) and then pat it all down so it’s compacted. Put it in the oven for 35 minutes. Leave it to cool completely, then cut up into bars. It’s that simple! 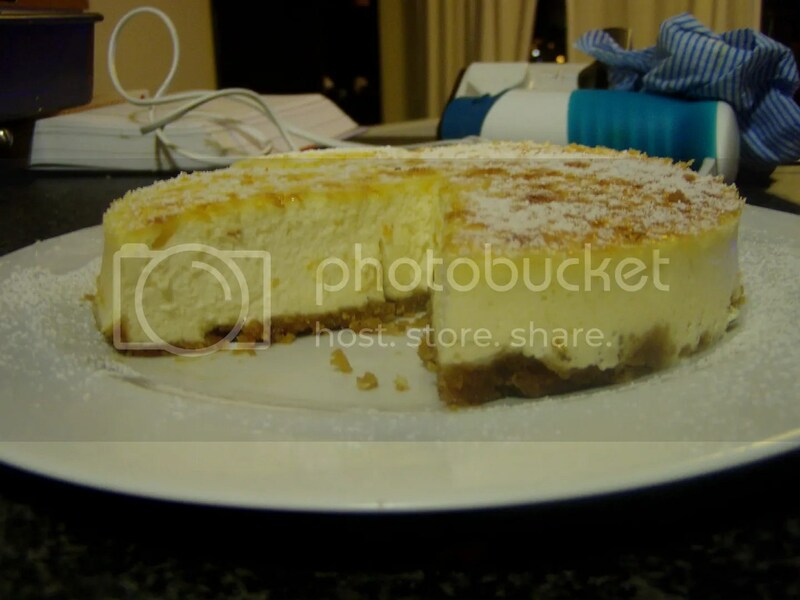 I’d never made a cheesecake before, but it was really easy. I combined bits from two recipes I have according to what I thought would taste best and and it worked well. You need a deep cake tin approximately 8 inches/20cm. Grease it well with butter and then you need to put it on some foil and press the foil all around the sides of the tin. This is so that when you place the cake in water (which you will) the water won’t seep into the cake tin and the cake. Pre-heat the oven to 160C/325F/Gas mark 3. Get a large roasting tin and fill it with water to a depth of about an inch. Put the roasting tray of water into the oven. This is a bain-marie. Now bash up the biscuits. Put them in a plastic bag and hit them with a blunt instrument. Try not to do yourself an injury. Cut up the butter finely and mix it with the biscuit crumbs with your fingers until it’s all mixed in and there are no big lumps of butter. Alternatively, just whizz the whole biscuits and butter in the mixer for a minute. Press the crushed biscuits into the bottom of the cake tin in an even layer. Now beat together the cream cheese, lemon juice and rind, sugar and vanilla essense. When it is smooth, add the egg a bit at a time, whisking it through so it is all smooth. I used a handheld blender. Pour the mixture into the cake tin on top of the biscuits. Put the cake tin, protected by the foil, into the bain-marie. Bake it for about an hour, then turn the oven off and let it sit in the oven for another 45 minutes or so. Take it out, let it cool, then gently remove it from the tin, running a knife around the edge to loosen it if you need to. Chill it well before serving, and you can make it look pretty by sprinkling some icing sugar over the top. My mother in law liked this cake very much. 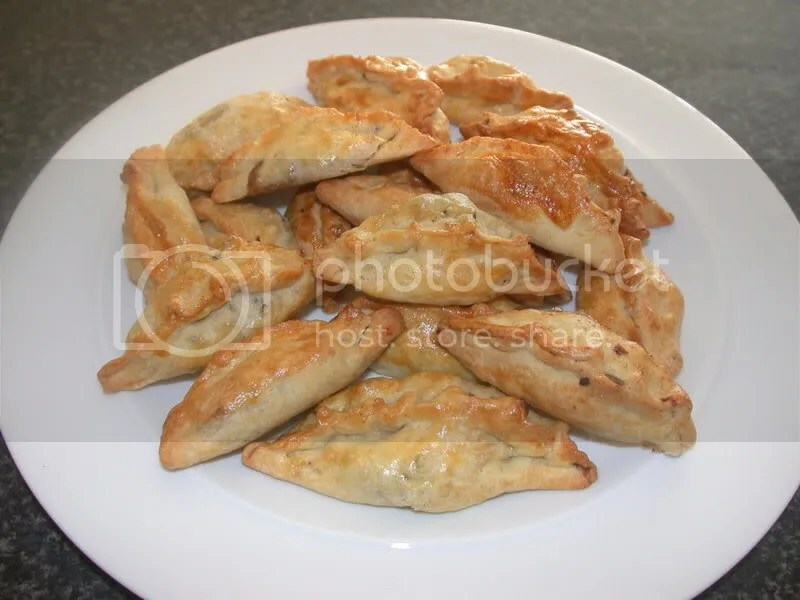 I have made Cornish Pasties before, but this recipe is adapted for little mini pasties. They’re good for taking to parties (dinner or otherwise) as a starter/snack/nibble or for impressing your friends and workmates. This recipe makes about 35 mini pasties, which may seem a lot but they’ll go quickly. Also, it’s difficult to make them in smaller quantities because even though you’re only using one small potato and one small carrot, you need 225g meat to get meat-to-veg ratio right and a little of the filling goes a long way. If you wanted to, you could make less by using half a potato and half a carrot but frankly, that way madness lies. You’d be left with random halves of vegetables lying around. That’s no use to anyone. Now put the butter into the flour and using your fingertips rub the butter into the flour. Try to do this lightly and be patient, it will get there in the end. Pop it in some cling film (saran wrap) or into a plastic sandwich bag (that’s what I use, less fiddly) and put it in the fridge to chill for half an hour. While that’s chilling, do your veg prep. Finely dice the onion, potato and carrot. Set a non-stick frying pan on a high heat and when it’s good and hot, tip in the minced meat and move it about, browning it. After a couple of minutes, tip in the diced veg and give it a stir. Splash over a few shakes of worcestershire sauce and some salt and pepper. Be a little more generous with the pepper than you normally would be. Sprinkle over the tablespoon of plain flour, mix it in and cook for a further minute. Now pour over a cup of stock and reduce the heat to a simmer. After 5 minutes or so the veg should be softening up and the liquid thickening and reducing. You don’t want it too wet otherwise it’ll make the pastry soggy – it just wants to be moist. If there’s too much liquid, turn up the heat and reduce it a bit. Take the filling mix off the heat and set it aside to cool. Pre-heat the oven to 200C/400F/gas mark 6. 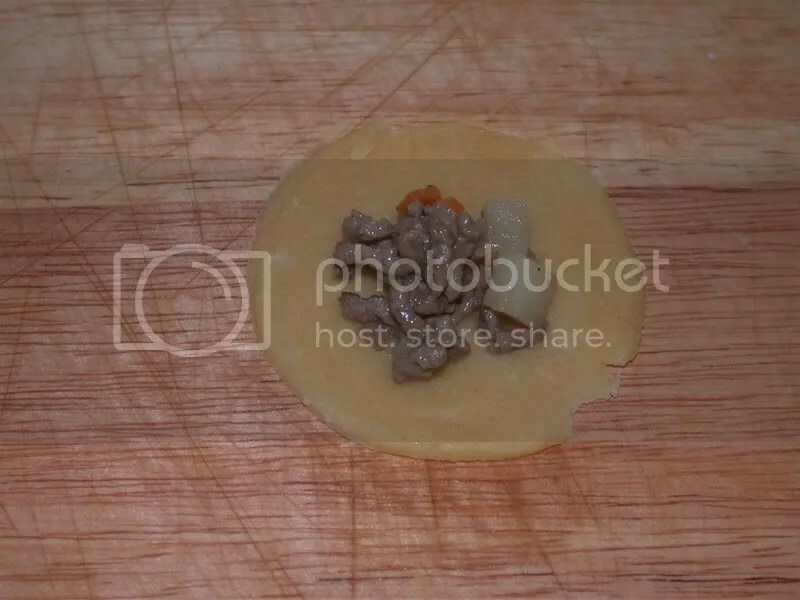 Okay, now take the pastry out of the fridge, divide it into thirds and wrap two pieces back up and put them back in the fridge. Sprinkle flour on a large chopping board or just a kitchen surface and sprinkle some on your rolling pin to stop it sticking. Roll out the pastry until it’s quite thin – about as thin as you dare before you think it might tear when you move it. Now cut circles out of the pastry – if you have a pastry cutter, well done and you should use that. I don’t have one, so I use the end of a can of tomatoes which works just as well. Peal away the offcuts of pastry, ball it up and cover it to stop it getting dry. And fold the circle over. Pinch the edges together and put it pinched end up on a baking try. Do the same with the rest of the circles and roll out the rest of the pastry and repeat until it’s all used up. Beat an egg and if you have a pastry brush, brush the egg over the pasties to glaze them. I don’t have a pastry brush so I used some kitchen roll dipped into the egg and then wiped over the pasties. Works just as well. Put the baking tray with the pasties into the oven for 10-15 minutes until they’re golden brown. Do it in batches if necessary. Now, eat! Hot or cold, both works well. Tasty, innit? 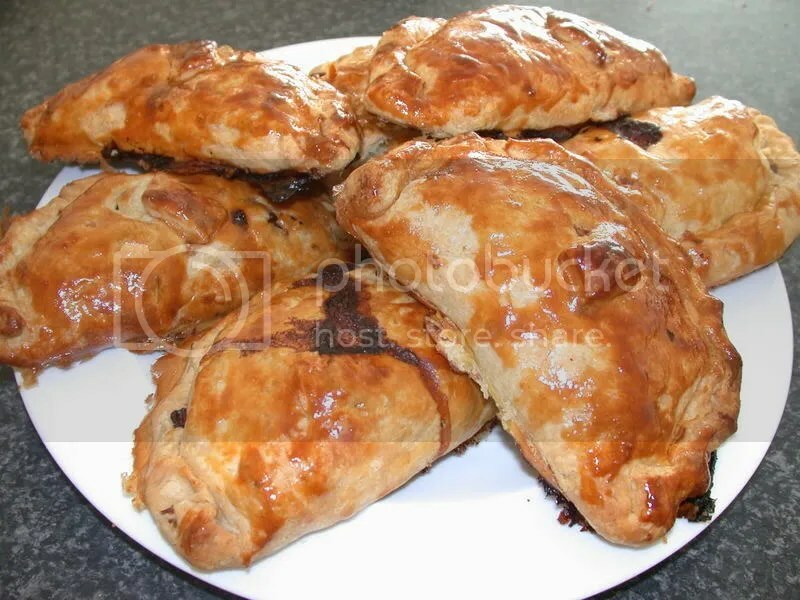 A classic British recipe, these pasties are fantastic for taking out and about or eating at home. We ate ours walking down the high street on the way to the dog races, how’s that for Laaahnden life? Sorry Cornwallians, the pasties were right at home with us. Okay, make sure you’re wearing an apron. Making pastry is messy. 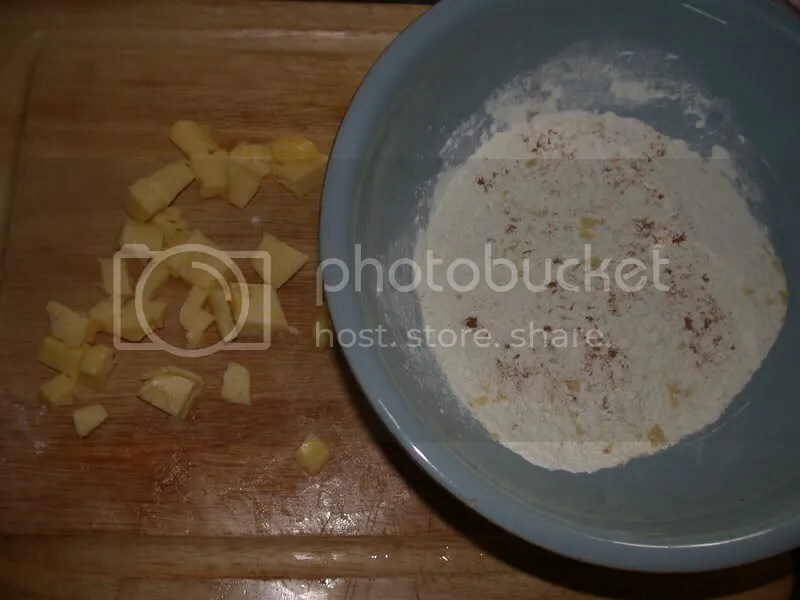 Sift the flour and salt into a large bowl and then rub in the cubes of lard and butter with your fingertips. Try to do this lightly with the tips of your fingers and persevere until the mixture resembles fine breadcrumbs. This takes about 5 or 10 minutes. Add two tablespoons of very cold water to the mixture and mix it to a firm dough, first with a knife and then with your hands. If absolutely necessary, add more water but the pastry should not be too damp – although crumbly pastry is more difficult to handle, it produces a lighter result. Roll the pastry into a ball, cover in it clingfilm (saran wrap) and pop it in the fridge while you get on with the filling. I made half my pasties with meat and half without for my vegetarian friends. 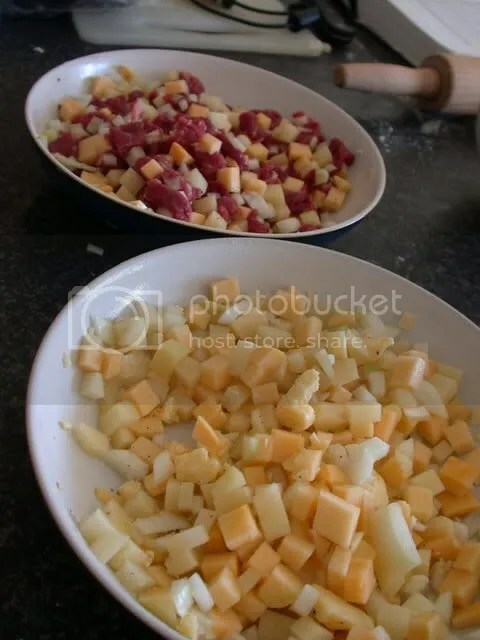 If you’d like to do this, use 200g chuck steak instead of 300g and divide the vegetables unevenly to make each half have an equal amount of filling. Take the pastry out of the fridge and divide it into 7 balls. Flour your chopping board and rolling pin and roll out the balls of dough to about 5mm thickness. Take about a handful of the filling and pop it in the centre of each rolled out pastry. Do this is batches if you haven’t got room. Fold the pastry over the filling and squish the edges together to seal it. Bring the edges in towards the centre and fold over, so you create a kind of rolled edge. Using your thumb and forefinger, crimp this roll by doing little pinches all along it – see the above picture for how this looks. Place on a baking tray and brush with the egg yolks all over to glaze them. Pop them in the oven for 45-50 minutes. If they look like they’re going too brown, cover them. Eat hot or cold. Lovely. There’s a lot of emphasis these days put on “easy” cooking. And sure, it’s important to have a good stock of simple recipes you can knock up in no time. But sometimes, it’s good to take on a challenge. Choux pastry takes a bit of concentration, but it’s not the hardest thing on he world and once you’ve learnt how to do it, it’s an excellent string to a cook’s bow. 3 medium eggs, beaten with a fork. With most recipes you can mess around a bit, fudge the amounts, cut stuff out if you feel like it. But please, don’t do that here. Measure carefully, that’s the secret to choux pastry. I made this in a cookery class and the teacher was standing over me, making sure I measured exactly, and it’s good that she did because it came out well. Follow the recipe carefully, it’s tried and tested and will work, I promise. 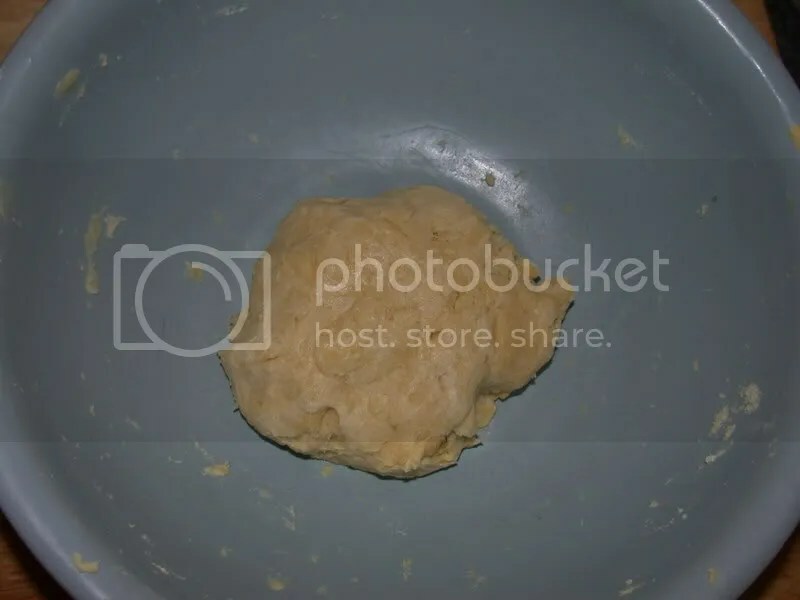 First, put the water and butter for the pastry in a saucepan and bring them slowly to the boil, making sure that that the butter melts before the water boils. 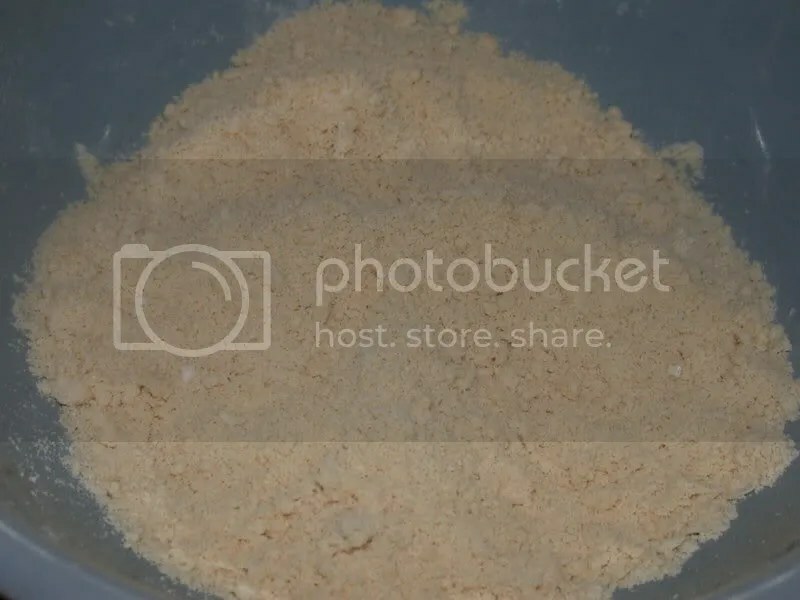 Grab a whisk, have it handy, then pour in the flour all at once, immediately whisking firmly and quickly until the dough comes away from the sides of the pan. It’ll be a bit like wallpaper paste, smooth and glossy. Take the pan off the heat and add the beaten eggs a little at a time, stirring with a wooden spoon all the time. Don’t panic if it goes a bit sloppy, just keep stirring. Once all the eggs have been added, it should have the same texture as it did before you added the eggs but will now be glossy. Glossy wallpaper paste. Lovely. 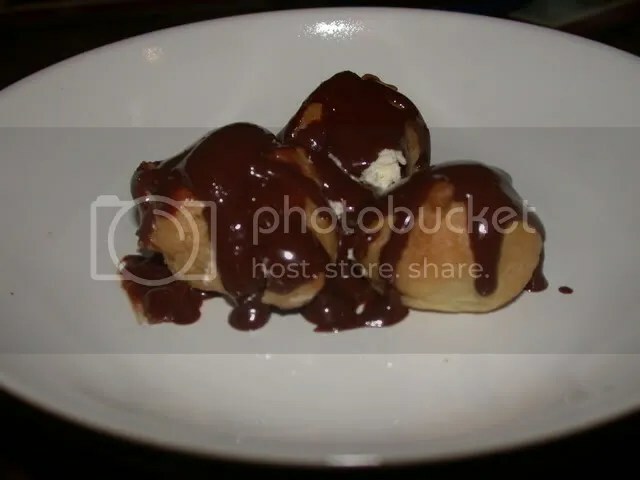 Grease a baking tray and using a spoon (or two) , put small balls of the dough about the size of a pingpong ball onto the tray. Sprinkle water around the pastires and turn the oven up to 220F/425F/Gas 7. Bake the pastries for 30-40 minutes until well-risen and light brown. Melt the chocolate with the water in a saucepan over a low heat. When it’s smooth, add the sugar. When the sugar has dissolved bring the solution to the boil and boil for 10-15 minutes until the sauce is rich and syrupy. Lift the pastries off the baking tray and prick each one to release the steam. Allow them to go cold. Whisk the cream until it’s light and fluffy, make a slit in the bottom of each pastry and either spoon or pipe the cream in. Pile the pastries into a pyramid and pour over the sauce. Await praise from your friends and family. Check that baby out. It was my first time making this and if I can make it look and taste that good, you can too. Crack the eggs and separate the yolks (don’t throw away the egg whites). Make a ring of flour on your chopping board. But the butter, egg yolks, sugar, cinnamon and water in the centre of the circle and mush it all together with your hands. 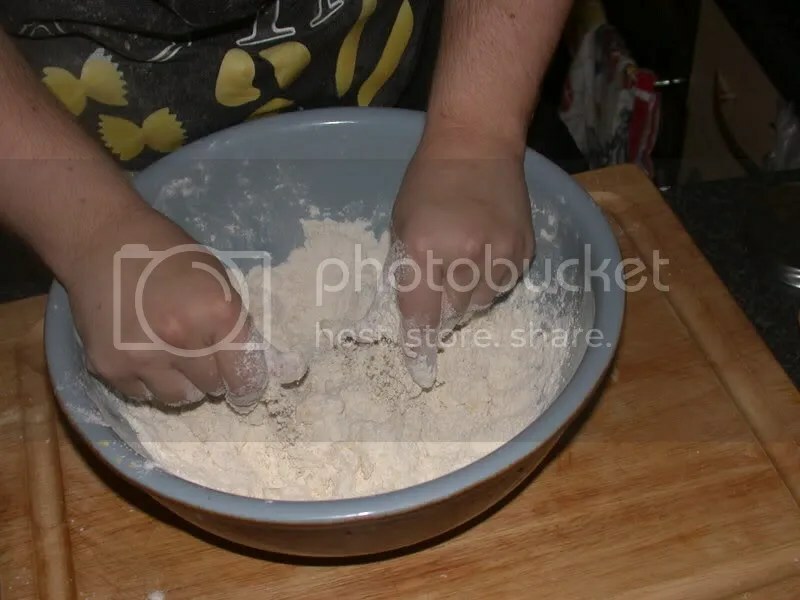 Gradually draw the flour into the mush, flicking it in a bit at a time until the whole thing is mixed together well. It will seem quite wet but don’t worry about it. Mix in the chopped walnuts. Pop the whole lot in some cling film (saran wrap), wrap it up and put it in the fridge for an hour or so. Peel and quarter the pears and carefully cut the cores out. Put the water and sugar into a pan and bring it to the boil. Let it boil for 10 minutes or so until it goes a bit glossy. Put the pear quarters in the sugar solution and simmer for about 4 minutes. Remove the pears from the liquid and set aside on some kitchen paper to dry and cool. After an hour, take the dough out of the fridge. It should be slightly firmer. On a floured chopping board roll out two thirds the dough into a circle with a rolling pin until it is the right size to fit the tart dish. Carefully lift the rolled out dough by rolling it round the rolling pin and lifting it – if it’s sticky, put some flour on the rolling pin. This might take a couple of tries because it’s quite tricky, but persevere. Lay the dough onto the tart dish and press down gently so it fits the dish snugly. Don’t worry if the edges aren’t neat, you can either trim it and patch it or leave it as it is for that home-made look. Now put the pear quarters in the dish in a circle with the thinner end towards the middle in a wheel shape. Pre-heat the oven to 180C/350F. Roll out the remaining third of the dough in a circle until it’s the right size to fit over the top of the pears and reach the edge. Stamp out a 3-inch circle in the middle of the dough (I used the end of a tin of beans, pressed into the middle of the dough). 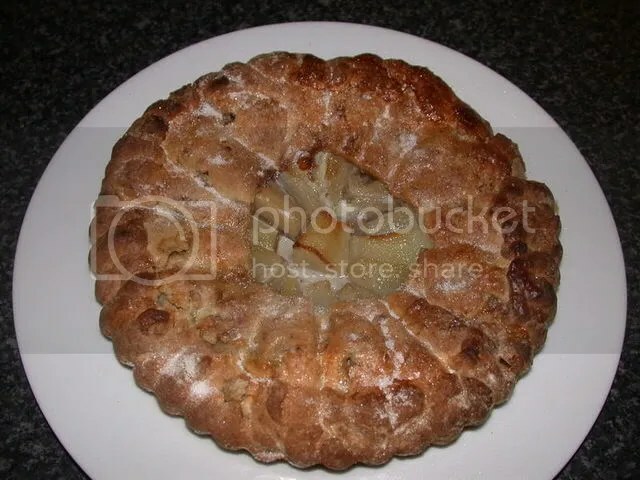 Now lift the ring of pastry and put it over the pears and smoosh the edges with the dough that’s lining the tart. Fold the edges of the dough that’s lining the dish over the edge of the top layer of dough. Brush the dough with the egg white you reserved in a cup earlier – this will make it shiny when cooked. Put the whole thing into the pre-heated oven for 30/35 minutes until it is golden brown. Sprinkle some sugar over the top and serve it hot or cold with cream or ice cream. Wickedly delicious.